Every year the annual convention event is getting bigger and bigger. This year, the Dreamforce is expected to attract over 135,000 people in 18 venues in the Moscone Center neighborhood. It must be mentioned here that in 2003, the year when the inaugural conference was held it catered to only 1300 people. Though it may be a business conference, it is expected to attract celebrities from all walks of life. The list includes presidential candidate Hillary Clinton, ex-vice president Al Gore, renowned online publisher Huffington and entertainer Bruno Mars and Neil Young. Meanwhile, a wearable smart band will be introduced by musician Will.i.am that allows sixth sense mentality. Dreamforce will represent more than just gadgets and glitz. The conference goers are connected to Salesforce products, and the conference will mean a lot in terms of increasing business productivity. Most companies are run on this platform. The most awaited topic of discussion would be how Salesforce is planning to expand its cloud utilities to improve customer interaction and understand their needs. In a tweet Marc Benioff, CEO hinted on analytics cloud only to change it soon to Project Wave. So the next big thing for Salesforce would be Project Wave. Speaking of the conference content, Brent Thill, Managing Director, and Senior Analyst at UBS said that despite the hype, there is more of depth expected. Salesforce products are around for more than 15 years now, and it is eating up a lot of information. The products offered include human resource management, customer service and software support. The information is a treasure trove that Salesforce has to capitalize. The conference will help convince Salesforce customers that they are better than their rivals Microsoft, Oracle, and IBM. It may be remembered that in May, Microsoft joined with Salesforce to integrate the latter customer relationship management platform and applications with Office 365 and Windows OS. The deal is a proof on how Salesforce is reaching newer heights in cloud computing. Going a step further Thill happily compared Benioff to Steve Jobs. 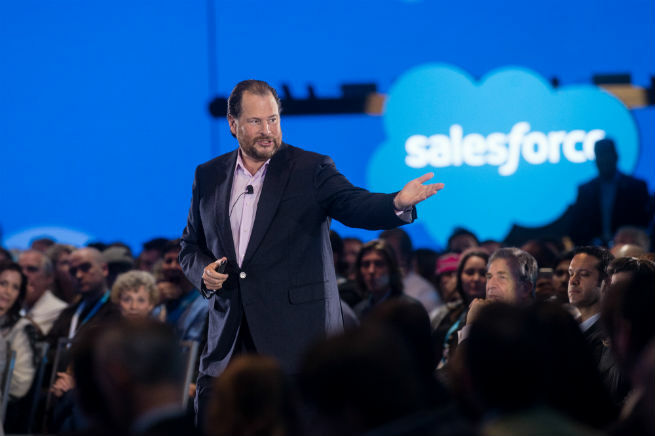 Salesforce that was once shunning the cloud is now ready to embrace it, and this could mean a lot to the business world. He furthered that Benioff’s statements cannot be taken for hype, but it is the reality that he wishes to embrace. Once question left unanswered at the conference will be whether the company will be able to keep up the momentum. Continuous Salesforce training is the best solution to reach the goals of your organization. Turning to the philanthropic side, Benioff has asked the participants at the conference to carry a food can to deliver it to over 1 million hunger people in need of food. The conference will conduct special events exclusively to benefit NGOs, military veterans, and education. The Salesforce conference had Satya Nadella explaining Microsoft products in detail and demoing them. He spoke extensively of the vision of Microsoft and demonstrating their prime products like Office 365, Windows Hello, Cortana and Outlook on iOS. He explained how the product is not restricted to a single device. Most participants lose connect of the conference, once their leave the venue. It is important to re-enter the event even after it is long over. Connections are important. Do not forget to network. If you have collected their contacts, it is time to drop a mail in their inbox. Taking notes at the session can prove beneficial when you want to gather your thought. One reference can bring you back into the subject without much effort. The demo is done for you to practice. Put it to immediate use before it turns stale or you simply forget how to use it. In case you do not have the product or application, it is time to download from the company website and subscribe for an update. Everyone attends a conference with some goal or the other. Once the conference is over, check out if the goals are accomplished. If you haven’t achieved it, then it is time to contact the representatives for slides, content or resources. If there is any gap in attaining the goals, it is time you fill it up immediately. Not everyone in your team would be able to make it to the conference. So it is important you share the resource for the larger benefit of the organization. Schedule a presentation to share with your team. Be the first to educate your team on the industry trends.